LAS VEGAS: The two-year hiatus in fighting in US soil didn’t diminish Manny Pacquiao’s popularity among American fans especially in this gambling city he called his second home. This, the Filipino World Boxing Association welterweight champion found it anew Tuesday during the Grand Arrival ceremony in connection with his coming fight with American challenger Adrien Broner on Saturday (Sunday in Manila) at the MGM Grand Arena. Despite heavy rains that have been striking the city the past few days, still thousands filled the MGM lobby, site of the event, and spilled outside the façade as early as noon for the traditional rites scheduled at 3 in the afternoon. 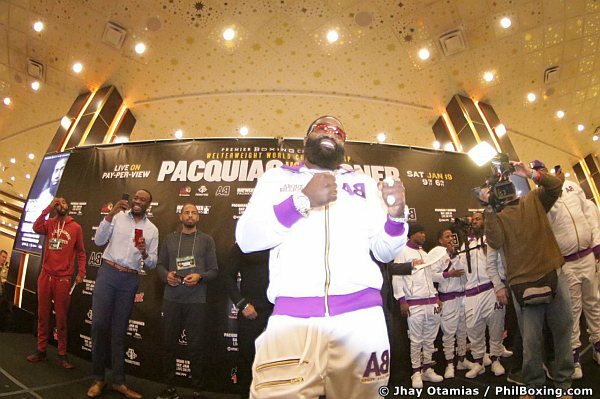 Broner waves to the crowd during Tuesday's grand arrival at the MGM Grand Hotel in Las Vegas. 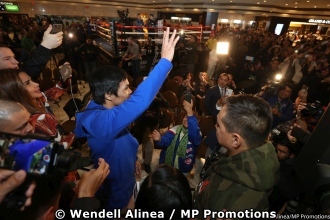 And while fans expressed their excitement by greeting the ”People’s Champ” warmly and wildly, and so was Pacquiao, whom upon reaching the stage, raised both his hands by way of acknowledging them. “I can’t wait to be on the ring,” Pacquiao said during a post Grand Arrival interview with international media men. 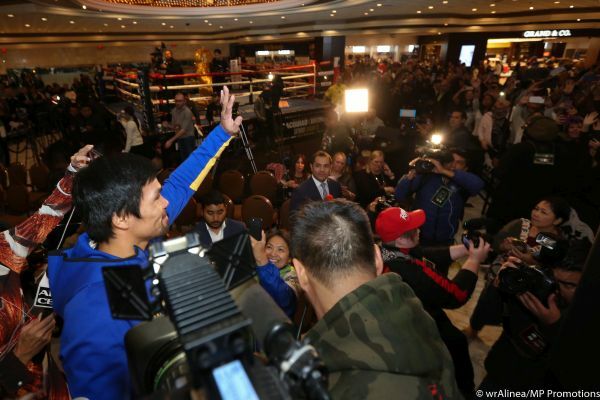 Manny Pacquiao waves to fans upon his grand arrival at the MGM Grand Hotel in Las Vegas Tuesday. While the fighting senator had fought and filled many other fighting venues in the U.S like the Dallas Cowboys Stadium and the Alamodome, both in Texas, among others, the MGM Grand is especially close to his heart as it was here where he started to make a name when in 2001, he stopped Lehlo Ledwaba to formally announced to the boxing world of his coming. Pacquiao and his team actually arrived here Monday evening following a long, five-hour drive from Los Angeles where he spent three weeks in the second leg of his preparation for the Broner fight. He came to the Grand Arrival rites from a light training session at the Bones Adams gym here. But it’s going to be more than that for Pacquiao, whose career enjoyed a revival of sort when he knocked out Lucas Matthysse in the seventh round to wrest the World Boxing Association welterweight championship in Kuala Lumpur last July. “That KO win was very important to me because I want to prove something, this being my first fight since I turned 40,” during the subsequent press interview. “I’m still passionate about the sport of boxing and boxing is my passion. That’s why I’m still here continuing fighting,” said Pacquiao.